There are so many ways to make it. Broiled, grilled, pan fried, oven baked, slow cooked, sautéed, you name it. Our friends were having a small get-together at their house for the last NASCAR race of the year. They decided to have a little competition with the husbands and have a wing cook-off. Well, my hubby has been working a lot of off hours and overtime and just didn’t have time to put 100% into making some good wings. So I decided I would make them for him. I bought the wings that have the wing and drummette attached. 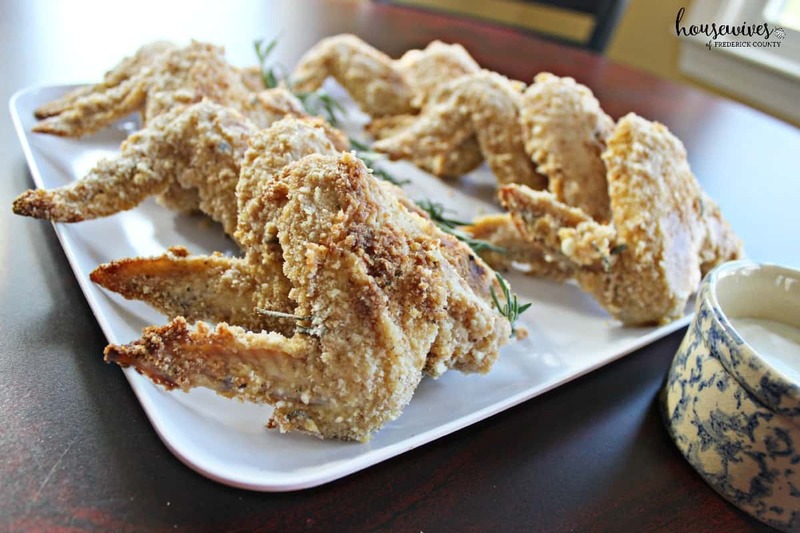 These are actually called the whole chicken wing. 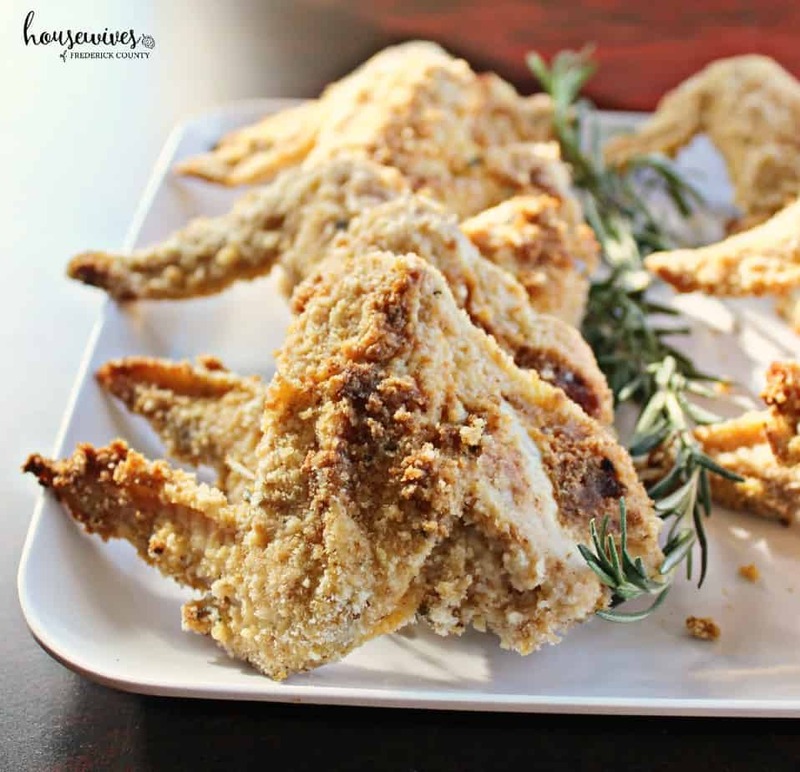 Many people’s preference is to separate the wing part from the drummette part. I figured it would be easy enough to separate them. Well, you either need an extremely sharp knife that will cut through bone and cartilage or some really sharp kitchen scissors. Neither of mine were sharp enough. Plus, it’s kinda gross to cut through all of that. So I left the whole chicken wings as-is and cooked them that way. The wings turned out delicious! Line cookie sheet with tin foil and spray with cooking spray. 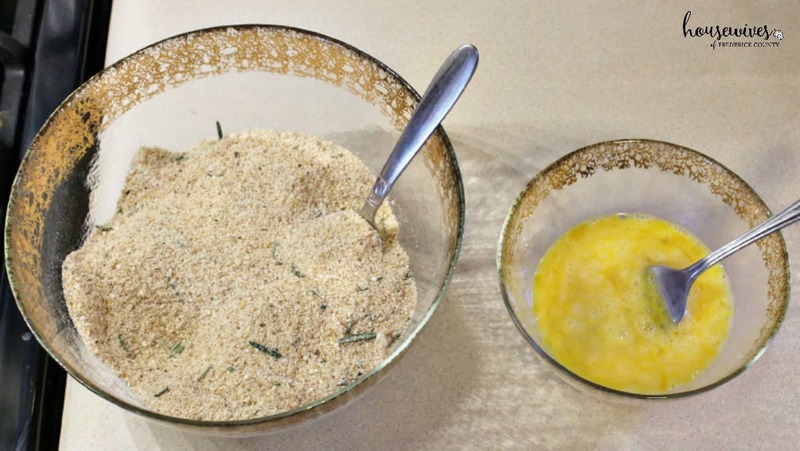 In a large bowl combine breadcrumbs, cheese, dressing mix, garlic powder, & 5 snipped rosemary sprigs. Mix well. Dip each chicken wing in beaten eggs. Then coat evenly with crumb mixture. Place chicken on cookie sheet. Bake 35 to 45 minutes, turning chicken halfway through baking. 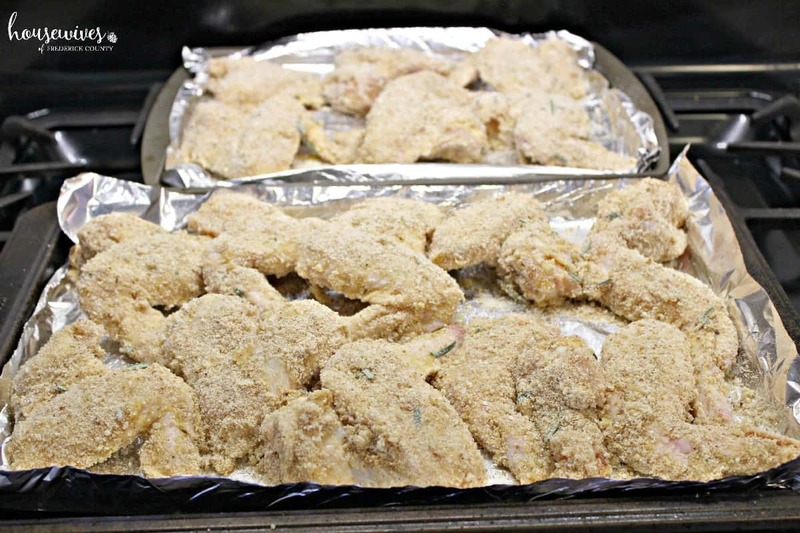 Remove chicken from oven when the outside is browned and the juice of the chicken is clear. Garnish with remaining rosemary sprigs. It’s a little messy dipping the chicken into the egg mixture and then the breadcrumb mixture, but nothing major. I kept my wings in the oven for 45 minutes so they’d get a nice brown, crispy coating on them. 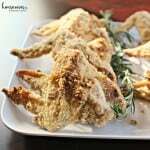 I served them with blue cheese dressing and garnished with rosemary sprigs. 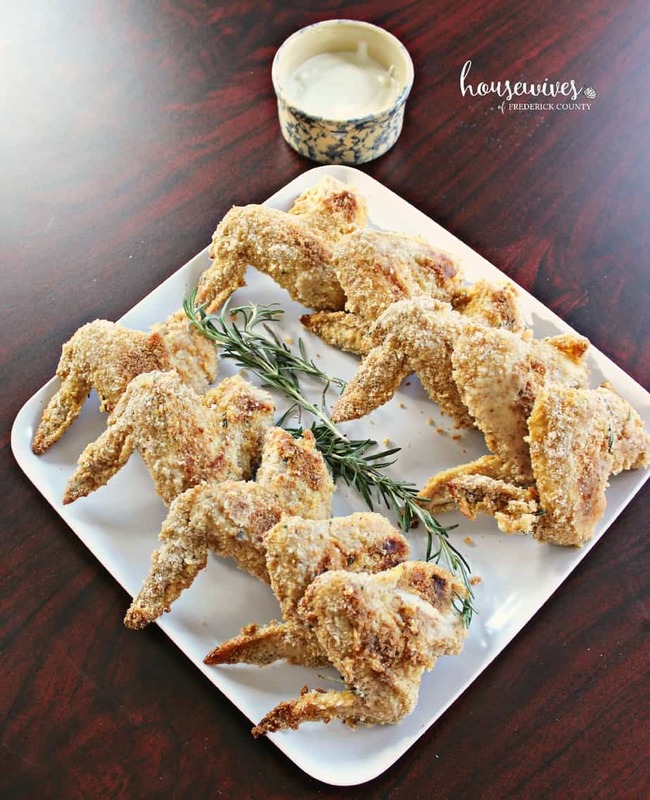 They tasted so good with the combination of rosemary, garlic, parmesan cheese, the ranch dressing mix and the breadcrumbs. My husband likes hot sauce on pretty much everything, so he added hot sauce and loved the wings. Sadly I didn’t win the wing competition. I’m assuming it’s because mine weren’t the traditional saucy, grilled type of wings. But everybody said they were really good! 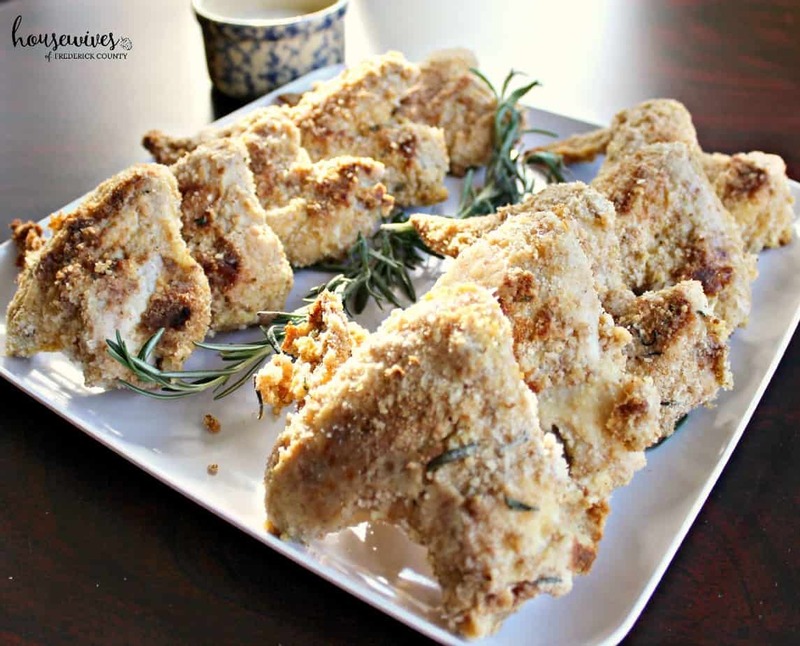 What’s your favorite go-to oven fried chicken recipe? Because you never can have too many chicken recipes!